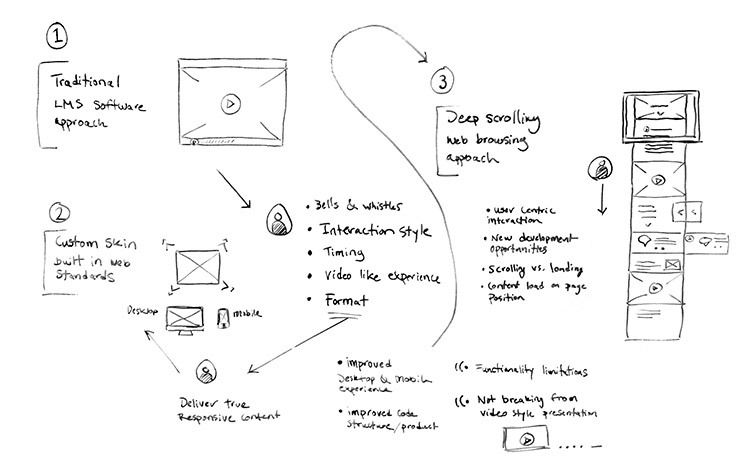 Creating a new web experience can be like making a new wine: you need fresh thinking, discipline, patience, work ethic, and a dash of good luck. 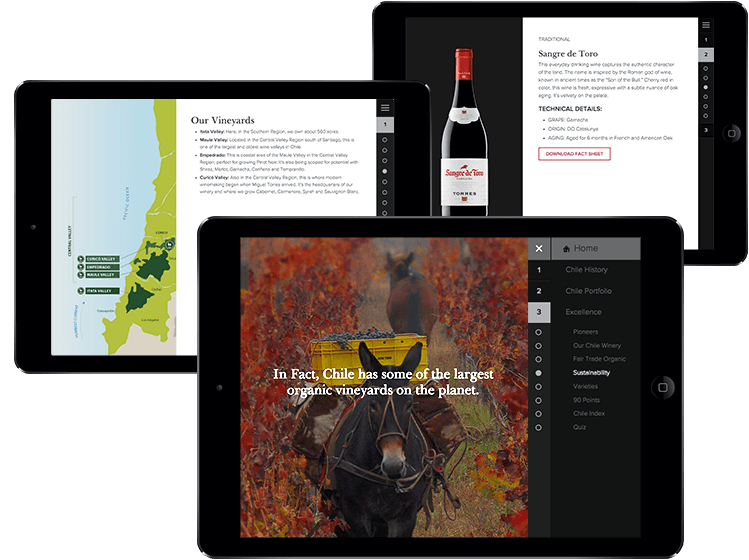 We needed all of these when we created a next-generation online learning experience for Torres – a venerated 145-year-old wine empire based in Spain. Many traditional courses are essentially recorded slideshows that require the student to remain passive and focus on listening to narration. They’re also designed for traditional desktop monitor screens. 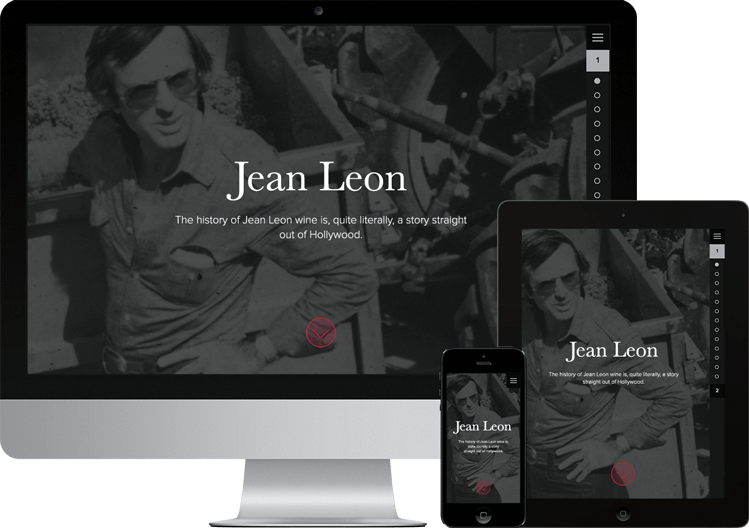 Our goal was to build a modern course that encourages active learning while adapting for easy viewing on any size screen, including mobile devices. We enlisted the help of our friends at Conveyor on the strategy and content for the assignment, and our blended team took the client goals and combined them with brand guidelines and some best e-learning practices to create an entirely new course for Torres. Just like winemaking innovation requires tossing out old assumptions, we quickly discarded the standard tools of the e-learning industry. Instead we reviewed modern digital storytelling websites and code libraries. 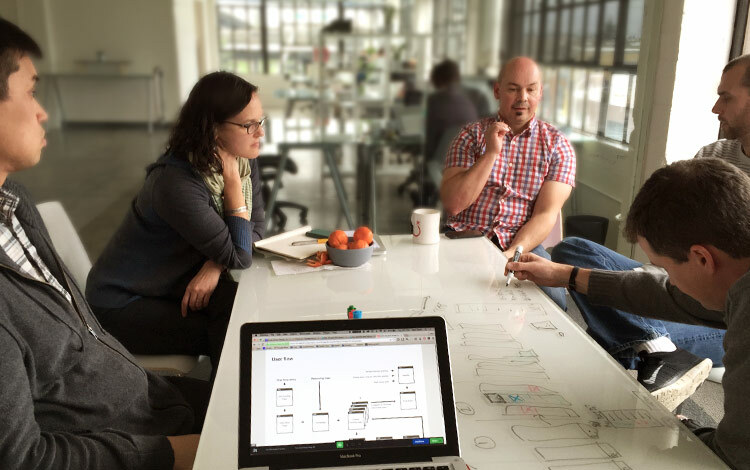 Through in-depth collaboration sessions, we developed a custom taxonomy, mapping out a truly responsive course layout that captures an elegant brand “look and feel,” integrated quizzes to improve retention, and active navigation to encourage user interaction. 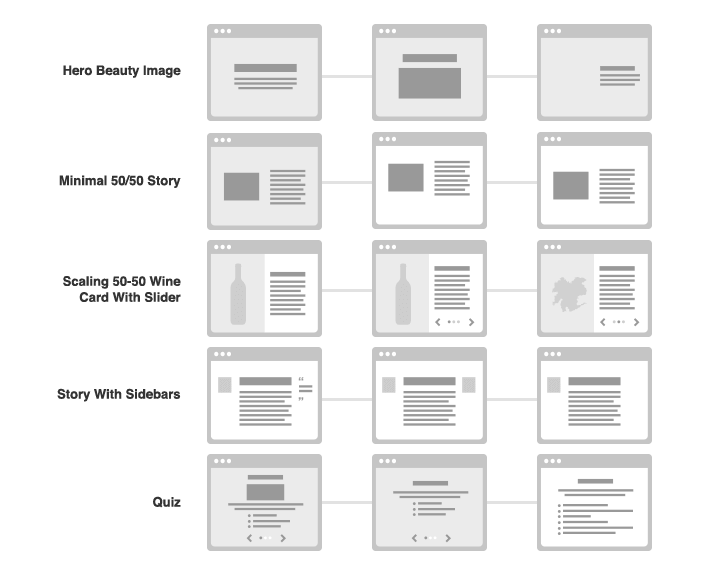 To organize the amount of content we collected on this historic brand and its 45 wines, we had to create a clear and robust information architecture. We built the new experience on modern code that was not trapped in a dated shell, because we knew it would be viewed on phones and devices yet-to-be-released. 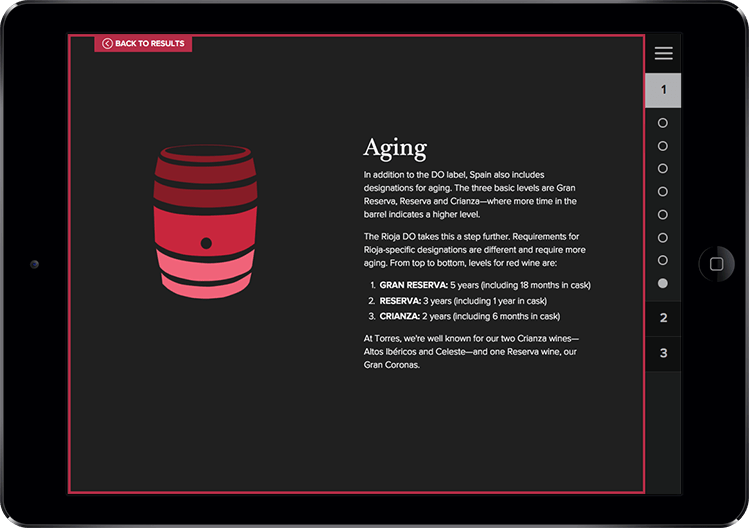 The model leads course pupils down deep, scrolling content pages to let them explore and learn wine details section by section. All the time, a clear navigation menu stays accessible through a simple expanding sidebar to help users navigate across chapters. While the Daylight development team built up the technological structure and content management system, the Conveyor content team began building course content with the Daylight designers. 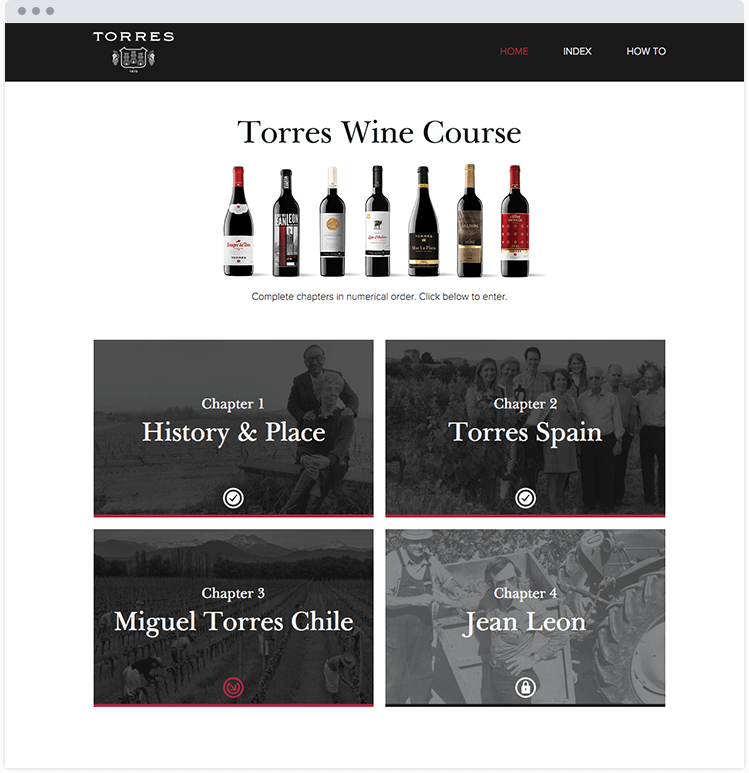 The course covered the history, place and product of four Torres brands—two Spanish wine labels, a Chilean label and Torres brandy. We sourced and treated historical brand photography into beautiful full-width images and background textures. Then we added historical videos, and recorded new audio for language terms and spoken quotations from the Torres founder’s story. 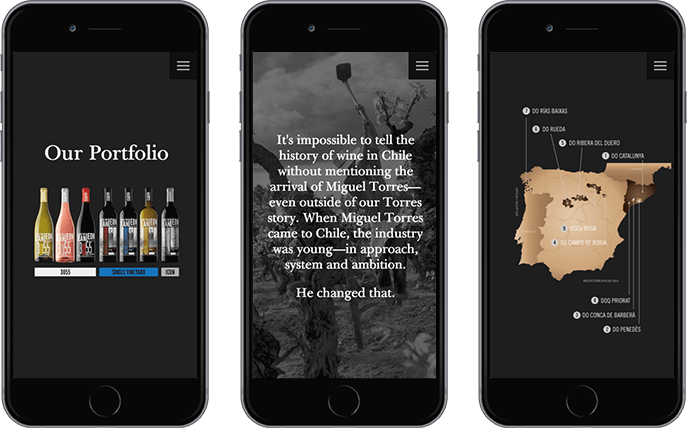 We combined these with the new text content to create a compelling digital story for the Torres brands. We built the course chapters in a customized version of the open-source FUEL content management system (CMS) to be SCORM-compliant. SCORM is a set of technical data standards for online learning courses that enable e-learning courses and systems to be compatible with one another. We also designed the course according to the client’s business process requirements, with “gates” that prevent users from skipping sections and remember where each user left off. Graphic progress bars guide the user through the chapters, while progress and scores are captured and sent to the client’s course administrator portal for management and record-keeping. 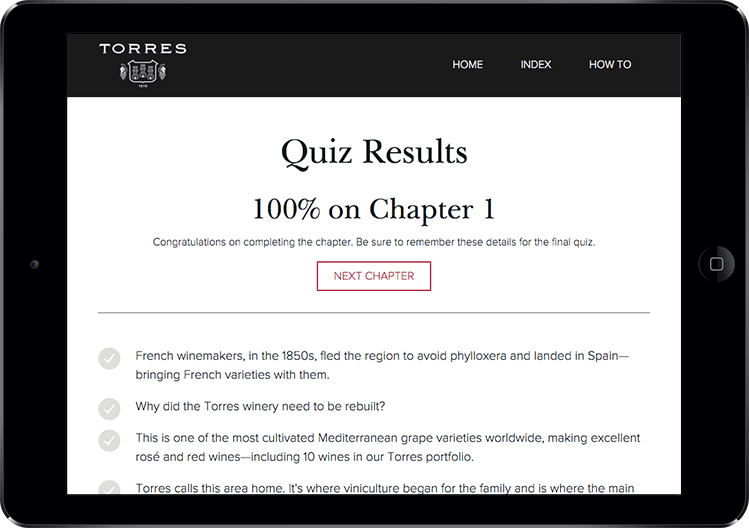 Not only was our content team becoming experts in Spanish grape varieties, they also dove into the science of quiz-taking and memory retention. Our course divided each chapter into smaller sections of content. Each section included a 3-question quiz. Then, to bolster learning and recall, we built a “review mode” into the course to let participants test their own memories before moving to the next chapter and on to the final test. And once users complete the course, they can access all course content in “unlocked mode” for handy reference – on any phone, tablet or computer. Just like the work of a dedicated winemaker, building a new kind of course from scratch required vision and perseverance. 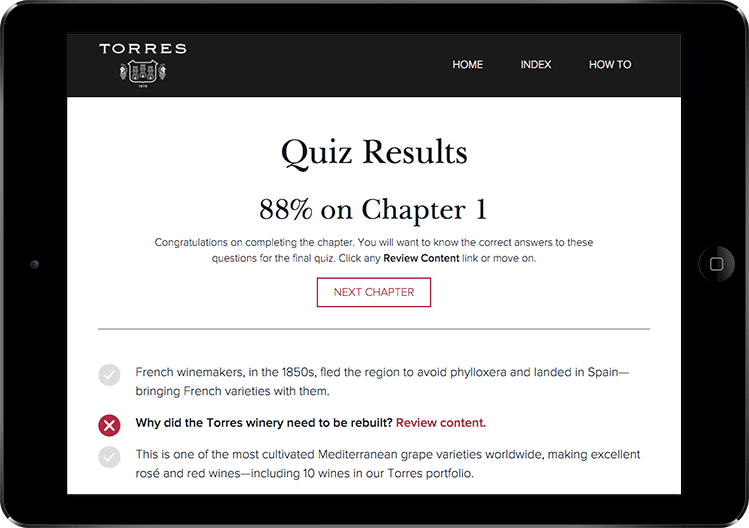 After we presented the final product, the Torres wine educators told us it surpassed the standard for LMS courses and could become an industry-wide role model for e-learning. We take that as sign of success. Interested in seeing more of our wine services?